It was an unusual place to be. There were about eighty of us, mainly men but some women too. I was the only non-Muslim present. We were in a hall down a dingy back street used for Asian weddings and other social events by those unable to afford the high-status venues in Manchester. The gathering was in honour of a sort of Sufi revivalist preacher. I had spotted the event on Facebook. I had heard about this man and wanted to hear him for myself. Most of those who attended belonged to his group. 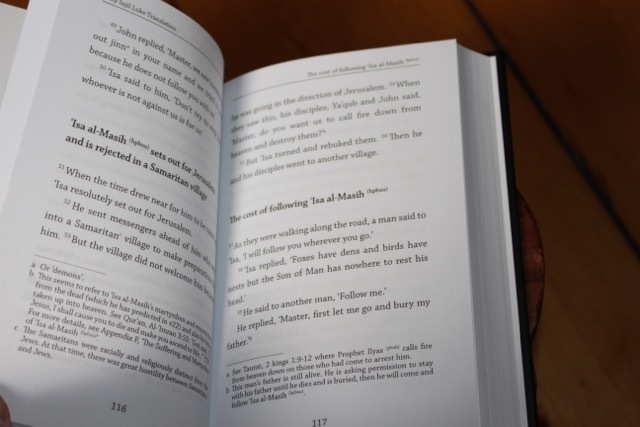 They sang their way through their standard liturgy in Arabic printed out in a beautifully presented book which supplied the text in Arabic along with a full English translation. The liturgy tells the story of the birth of Muhammad, embellished with legends and celebrations of his greatness. This was supplemented with hymns pronouncing blessings on Muhammad, who they styled as the mediating prophet. Then the visitor delivered a thirty-five minute sermon. He spoke on Muhammad’s uniqueness, his perfection, how he was purer than any man that ever lived and possessed a personal knowledge of God greater than anyone else ever, that he alone was the means by which the immense mercy of God was available to those who put their faith in him. Yes, he was taking the attributes of the Lord Jesus Christ, the Son of the Living God, and assigning them to Muhammad. It was depressing to listen to. The speaker instructed his listeners that pronouncing blessings of Muhammad was the key to being blessed by God. He further instructed them that imitating every detail of Muhammad’s practice in worship must be their top priority. No other worship would ever be accepted by God. How, I found myself thinking, could we ever talk about common ground with these people? But it was there. Here was an assembly seeking connection with God, knowing that they needed more than formal religion could supply. Here was a group of people convinced that God’s plan and purpose was that rather than depend on their own abilities to please God, that they should depend on a God-given mediator who could give them assurance of acceptance. What they were seeking exists and it is found in a different person, the man Christ Jesus (1 Timothy 2:5). May the glories of the true Christ be declared and revealed to them. The 150 Psalms of David have been called the ‘prayer book of the people of God’. They help to give us language to talk to God and are full of praise and adoration, plus real questions and lamentation. They give voice to our concerns. Psalm 10 has helped me express my own reaction to the Christchurch acts of terror at Masjid Al Noor and Linwood Mosque on 15 March. And it starts with the big question: WHY? Why, O Lord, do you stand far away? Why do you hide yourself in times of trouble? Archbishop Justin at Central mosque London: For British Muslims who are feeling under threat, we are with you. Hatred of Muslims denies and blasphemes Christ. Those who co-opt Christian language and history for hatred commit blasphemy. Ultimately, with God’s help, LIGHT will always prove stronger than darkness and LOVE will prevail, despite the cruelty and brutality present in the world. Today in Britain growing numbers of Muslims are choosing to follow Jesus; joining his family. We need to understand their needs, care for them and help them grow in him. And we want to learn from them. God is answering the prayers of many over years and now there are churches across the country grappling with the joy and the challenge of welcoming believers from a Muslim background. This month we are highlighting Joining the Family (JtF) resources – here is a message from Roxy, JtF coordinator. I love the word hospitality which for Muslims often starts in the heart attitude of honouring guests into their own homes. The Greek word for hospitality, Xenia (guest friendship), is again a heart attitude offering friendship to someone who may be far from home. The word Xenophobia is the fear or distrust of someone who seems strange or foreign. May we ask God to change our hearts towards people from Muslim backgrounds and not be afraid but be open to those who are far from home when they enter our churches, places that may seem strange and a long way from their spiritual home if not their physical home. I pray that as described by Tim Green (above) we would be people who offer guest friendship to people of Muslim backgrounds in laid back hospitality. It’s a crazy idea… When do we start? This is how my friend described Friday prayers – an important time in the week for him. How we long for our Muslim friends to know that they don’t have to do all these things to be right with God. How we need to pray that God will open their eyes to see the forgiveness that Jesus freely offers. As we see the crowds going to Jumaa prayer every Friday, what better time to be reminded of Jesus’ compassion for the crowds and to cry out to the Lord of the Harvest. Well, we now have such a ‘contrivance’, a means to unite in prayer on behalf of our Muslims neighbours. At noon on Fridays a UK-focused topic for prayer, a single prayer point, will be provided for us to unite in crying to the Father. It might not be possible for us all to pray at that exact same time but our prayers to the same end will powerfully combine. This is a big prayer of one Mahabba group going into 2019. Remarkable things are happening in the wider Muslim world - more Muslims have come to faith in Jesus in the past 25 years than in the previous 14 centuries combined! Why not here in the UK? These monthly newsletters have been highlighting the four Es that describe the Mahabba network. Each local expression of Mahabba is Encouraging prayer and Enabling and Envisioning all Christians to Engage in love with Muslims. We seek to envision the Christian community - all Christians, churches, church leaders - for God’s heart and purposes for the nations to be caught, for the church to see and seize the opportunities he has brought to our cities and towns. Let’s keep sharing the stories. If you are not yet part of Discourse, Mahabba Network’s discussion forum, do sign up here. It’s the place to be for sharing and learning from one another. This is an amazing time to be alive and partnering in prayer to see God’s purposes for Muslims fulfilled. Let’s pray this will be a fruitful year for us all, beyond all we ask or imagine. We value your prayers for this and welcome your feedback here. This is a great Christmas gift for Muslim friends, as well as to any Muslim who is interested in learning more about Isa al Masih (Jesus Christ) throughout the year. The new English translation of Luke was officially launched at a Christmas Mehfil, with guest, including the Scottish Ahlul Bayt Society. See below to order copies. Copies are available direct from the author. Christmas greetings to all across the Mahabba network! May we know, in a deeper way, Immanuel – the one who has ‘moved into the neighbourhood’ – for ourselves and our Muslim friends. These are just two of the courses and resources available. Find out more and think about planning a course or training with others near you in the new year. There are many ways equipping is happening and it would be great to hear what you have tried – what training has worked well and not so well. Please add a comment below. It’s that time of year when clocks are changed and we recognise ‘winter is coming’. The Celtic festival of Samhain, marks the end of harvest and the beginning of the darker half of the year, coinciding with Halloween or All Hallows Eve. Samhain was seen as a liminal time, when the boundary between this world and the Otherworld could more easily be crossed. That’s why people dressed in masks to fool the spirits. And in this darkness, we celebrate with Light and fire. Bonfires and Fireworks. And burning a guy! For Hindus Diwali, the Festival of light (Nov8th) symbolises the spiritual victory of light over darkness, good over evil and knowledge over ignorance. There is hope after despair and many suns after darkness. In the Qur’an, Allah is the Light of the heavens and the earth - Al Nur (Surah 24:35) And Hasrat. Isa (Jesus) is also called Light of God Nurullah ((4:174). With so much ‘Light’ in common it is so important in these dark days to strive to maintain the bonds of peace. To spread the light and help create interfaith harmony and community cohesion. To overcome hatred with LOVE (mahabba). We want to be able to Coexist, and live together without killing each other! The opposite of xenophobia, the hatred of the ‘other’ is Phileo-xenia, love for stranger, the biblical word for hospitality. Practice hospitality. And thus entertain angels unawares… This is the way of Love. This recent reflection shared by a UK missions leader is encouraging. We don’t always see the results of our praying, our reaching out in love - but we can be sure God is at work and responding to the prayers of his people. He’s moving in Muslim communities, working in hearts and drawing people to himself. Be encouraged! Our sowing in prayer and in love will reap a harvest. Maybe something there could be helpful for your situation. May all we do be grounded in fervent prayer. These updates will reflect more on the 4Es (encourage, enable, envision, engage) in coming months. Do add your thoughts and comments below. It would be great to hear something about prayer for you locally - struggles as well as successes. We want to be real in relating! The main take-aways for those attending the recent ‘Engage’ training day in Edinburgh were: to be more bold; more intentional; to just go for it; seize the moment; and be less afraid in stepping out and speaking up. This is so encouraging and so central to what Mahabba is about – ordinary Christians (not that such a person exists! ), all Christians, taking every opportunity to ‘sow’ widely and befriend Muslims. A few weeks ago we mentioned the Mahabba vision review which has been on-going across the summer. Thank you to many - local coordinators, regional facilitators, trustees and others connected (and not connected) with Mahabba - for valuable input. We were seeking greater clarity and focus in restating what the network is about. We felt God’s clear confirmation that Mahabba has a unique and strategic place in his purposes and of the distinctives and objectives we should hold and pursue. It’s more than six years since the network was formally launched and we’re grateful for all God is doing - yet sensed his push to go again with renewed expectation. Loving all Muslims - this ‘strapline’ highlights an overriding value for all we do - in prayer, in reaching out, in discipling precious Muslims… There will be many and varied approaches across the network but it’s always in love and with respect that we engage Muslims and their communities. A relational network giving Muslims the opportunity to find and follow Jesus - here is a restated vision-mission statement. Mahabba is not an organisation or agency, rather a network where there is sharing, mutual encouragement and support, relationship and resourcing. Our desire is that Muslims have the opportunity to discover Jesus for themselves and decide to follow him. We’ll expand on each of these four Es in the coming months with stories of how they are being worked out across the network, seeking to encourage greater sharing and learning from one another. Please feel free to add below more of your thoughts and reflections. This is a blog from a friend of Mahabba Network. Names and details have been deliberately removed to protect the identity of those involved, but praise God - he is working in the lives of Muslims to reveal Jesus! Can we borrow another pastor? This was not a worried congregation but rather some church members who had boarded the roller coaster of befriending Iranian asylum seekers. The pastor had pitched in by leading a private Bible study for them, but he was moving away. …was one question that was asked. With a little coaching, the ladies started using Come Follow Me. The participants work through the lesson on their own in English, Farsi or Arabic and then once a week they all come together to discuss, share and pray for each other. The material does not take them off into theological puzzles or doctrinal disputes but focusses on living as followers of Christ. If we go back to the Great Commission we find that Jesus himself put the emphasis on teaching people to obey all that he had commanded – most of which was the stuff of living. A retired office worker and a lady who irons clothes for a living were engaged in cross cultural discipleship. We are all familiar with the cry that the labourers are few (Matthew 9:36-38). Oh, how we would love to see an army of multi-lingual, highly trained, specialist workers of proven experience turning up on our doorsteps asking what we have for them to do. The people Jesus called that day to pray for labourers became the labourers. The truth is that for the most part we do not need more bodies, but we need the bodies we already have to be equipped and to discover that they can do the work. Come Follow Me is a wonderful piece of kit which enables non-experts to engage with confidence in helping new believers grow in Christ. The next training day is in Wakefield, Yorkshire, 27 October. Maybe request one near you? In the 1880s French artist Georges Seurat introduced an art form known as pointillism. 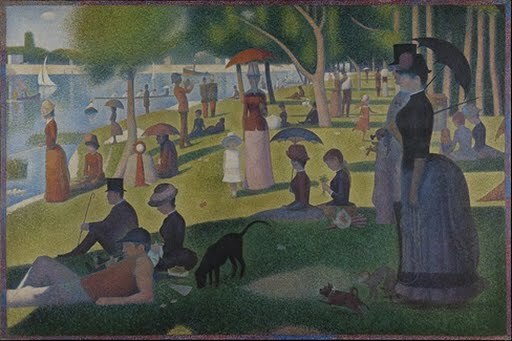 As the name suggests, Seurat used small dots, or points, of colour to create an artistic image. Up close, his work looks like groupings of individual dots. Yet as the observer steps back, the human eye blends the dots into brightly coloured portraits or landscapes. We can think of September as a month when we start filling the picture of our year with dots. Each day fills with greys, reds, ambers and greens, that may fill us with trepidation or excitement, and leave us feeling anywhere between exhausted or invigorated at the end of the day. It’s only when we step back and reflect that we start to see patterns and shapes. The picture that emerges may square up to the one we had in mind at the start. But more often, it has unexpected shades of light and dark that present us with a different image to the one we planned. In the same way, the two on the road to Emmaus (Luke 24:13) were reflecting on the ‘dots’ of events that had happened over the Passover weekend in Jerusalem. They saw only dark and sombre tones of violence and death. The picture of Jesus, as they left Jerusalem, did not square up to the picture they had planned for Jesus, the prophet, powerful in word and deed before God and the people (v. 19). Then Jesus joins up the dots for them, bringing the light and shade of Moses and the prophets, and all the things the scriptures had been saying about the Messiah (v. 27). As Jesus breaks the bread at home in Emmaus, they are given a moment to stand back and see the full, beautiful picture. In the same way, our ministries may push us right up against the canvas with busy schedules, scarce resources and a lack of workers for the harvest. We might have only our own dot and a couple surrounding in sight (and their colours might even be on the opposite side of the colour spectrum to ours). But are we perhaps forming a beautiful image together? On 13 October, Birmingham wants to have such a day of standing back and joining the dots of those working to engage with Muslims in our city. This is part of a series of regular updates from the leadership team within the Mahabba Network. They will be published here on the blog, but the best way to stay up to date is to sign up for our newsletter; you will receive a prompt when the latest one is available. Previous updates can be found here. A Mahabba update for everyone involved with Mahabba. ‘Lift up your eyes’, was the title and theme of Mahabba regional gatherings this year – to be inspired by what we’re seeing God doing among Muslims and encouraged and equipped in hearing from Mahabba groups in the regions. These were great events with very positive feedback from attendees and we would love to see more gatherings of this kind. Total numbers were well up on attendance at the national gathering in 2017 and learning from one another in ways like this is so much part of why the network exists. Here are some reports and quotes. Despite a few practical hitches the day worked well in drawing together new and existing friends and other networks. There was a great buzz of conversation going on throughout. A highlight and standout impression was of people getting to know about things happening closer to home and hearing from people who are not specialists or ‘professionals'. This is what Mahabba is about. Stories of what people are doing as part of their everyday lives are encouraging and need to be heard. So often Christians have contact with Muslims but don’t do anything with them because they are lacking confidence or don’t know where to start. Days like this can be so helpful to take inspiration from others in taking steps towards Muslims. Some commented that they wish they'd invited others – there’s always next time! More than 60 attended, mostly from London but also from a bit further afield. We heard encouraging stories from eight different London Mahabba prayer groups. Some are still small and struggling with lack of interest from churches. Yet they also told amazing stories of running successful 'Meetings for Understanding', of church leaders getting involved, evangelistic events being hosted and engagement with Muslims in their communities and local Mosques. We shared on the different resources available to help the groups engage in reaching out, sharing good news and making disciples (such as Friendship First, Come Follow Me, Joining the Family, Al Massira, Discovery Bible Studies…). About 60 people came from across the North, from Liverpool in the west and Hull in the East. Steve, John, Deborah and Phil R were among the contributors and the event was greatly enhanced by the presence of the Resonance Band leading multilingual worship. As always, for many participants it was hearing from other Mahabba groups that was the main encouragement. So three quite different events but with the same outcomes – people inspired, encouraged and equipped for renewed commitment to prayer and reaching out locally. We would love to hear from you how something from the event you attended spoke to your situation – please see below to submit feedback. There are more gatherings to follow; first for Birmingham and the Midlands on 13th October - ‘Joining the Dots’, connecting and equipping the church to reach out to Muslims. See below to find out more. We are making really good progress with the Mahabba vision process. We’ll come back with more next month and look forward to hearing more of your thoughts. Thank you so much for your prayers and have a good summer. This is the first of a series of regular updates from the leadership team within the Mahabba Network. They will be published here on the blog, but the best way to stay up to date is to sign up for our newsletter; you will receive a prompt when the latest one is available. Welcome to the first of a new series of Mahabba Updates for everyone involved with Mahabba. The trustees called a Vision Day with the aim of bringing clarity and focus to Mahabba’s vision, structure and operation. Understandably, this ‘day’ has developed into a process, which involved a very significant and well-led discussion on 12th June, but which is still ongoing. All involved believe that the Mahabba initiative, emphasising a relational engagement with Muslims, is crucially important for our country at this time, for the UK church, for the long-standing Muslim community here and for Muslims arriving as refugees. We now have a better understanding of what we are about and over the summer we aim to identify the right words to express that clearly in both a comprehensive and memorable statements. This is crucial to achieving clarity and focus and we ask for your prayers. Mahabba is rapidly running out of money. Despite numerous applications, we have not had any significant grant income for several months. The trustees decided that recent experience suggests we cannot rely on, assume or plan for any grant income but need to reduce our expenditure to match the £1,000 that comes in regularly from individual donors. These decisions are inevitable if the trustees are to act responsibly, but it will bring financial difficulty and uncertainty to several people and some may feel they have to look for paid employment elsewhere. Thanks for your interest and support. God is doing amazing things and it is a great time to be alive. Pass it on to those you know and encourage them to join the distribution list here. We value your prayers for this and welcome your input to bryanjknell@gmail.com. This is a real-life story of recent events from friends of Mahabba Network. Names and details have been deliberately removed to protect the identity of those involved, but praise God - he is working in the lives of Muslims to reveal Jesus! About 5 years ago one of our regulars got involved in a sort of city farm project. It is in an area of stark terraces almost entirely occupied by Bangladeshis. The project was secular but with several white Christians heavily involved. When we met to pray, we heard tales of plastic tunnels being vandalised and project personnel being threatened. All we could do was pray. The other evening, I went to the site for a prayer meeting. The gate was open. There were no high fences, no barbed wire, no security measures of any kind. Some Asian teenagers sitting on the benches greeted us politely. The project is highly valued by the community. Members of many families use the project. They grow vegetables. Children come to learn about nature. It is a place of peace and harmony. God has answered prayer. Have you been touched by this story? If so, you can play your part. It's a wrap - Ramadan 2018! We've just finished our fifth annual Lovefast campaign, which complements the 30 Days of Prayer booklet. Lovefast is designed to help Christians not only pray but engage with Muslims practically during the month of Ramandan. We've had some great feedback, which we wanted to share. I have really appreciated these daily additions to the 30 Days booklet. It has been great to have a UK twist and to have specific action steps to consider too. Shared iftar with a Syrian family yesterday. Said to them we have eaten together and played together but not prayed together. So we discussed that we could pray more than four times a day. If you've been involved with Lovefast this year or been touched by what you have heard, please consider giving to the ministry of Mahahha. We need your help to continue and develop as we connect with and equip Christians to engage with Muslims.